ESET NOD32 Antivirus is an award-winning antivirus with fast and powerful detection of viruses, worms, Trojans, rootkits and other malware. ESET NOD32 Antivirus also has security features dedicated to filtering applications and emails, blocking e-threats while surfing the web, and preventing phishing. ESET NOD32 Antivirus is an award-winning antivirus with fast and powerful detection of viruses, worms, Trojans, rootkits and other malware. ESET NOD32 Antivirus features an all-new Anti-Phishing module that identifies and protects you from fake websites trying to acquire your personal information. Enjoy your time online—protected with ESET NOD32 Antivirus. Your best defense against viruses, trojans and other forms of malware—and the top choice for IT professionals. Powered by the ThreatSense® engine with advanced heuristics, which blocks far more unknown threats than the competition. 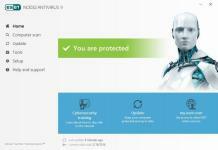 The latest generation of the legendary ESET NOD32 Antivirus takes your security to a whole new level. Built for a low footprint, fast scanning, it packs security features and customization options for consistent and personalized security online or off. The last time ESET updated its two security suites--the antivirus and anti-malware-only NOD32 and the more feature-heavy alternative Smart Security--it was a different computer security world. It was March 2009: Anonymous barely existed, Stuxnet hadn't gone public, and ransomware was the stuff of science fiction. Rely on our proven Antivirus and Antispyware protection—with unique detection technology. Advanced Memory Scanner protects you from heavily encrypted malware, while preventing web browser attacks is a job for Exploit Blocker. Stay protected while using social media. Decide which information is visible to public, and make changes to your profile you see fit. * On Facebook, protect you and your friend's timeline messages and newsfeed against malware. * On Twitter, protect your profile and posts, as well as those you follow against malicious links. 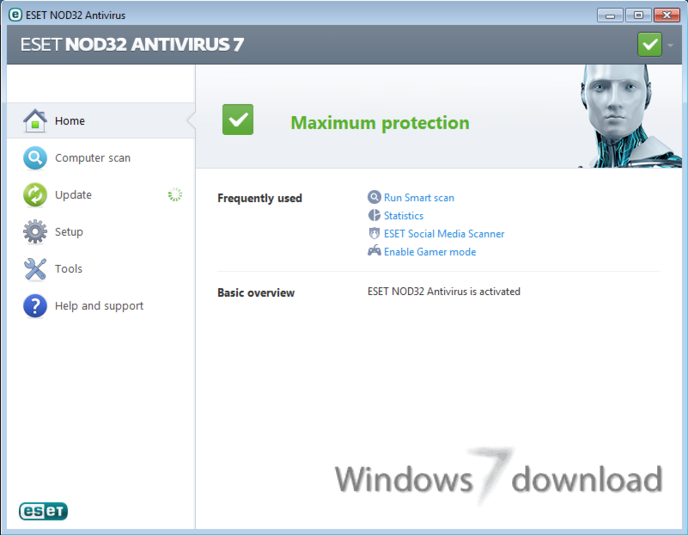 All NOD32 Antivirus (32 bit) reviews, submitted ratings and written comments become the sole property of Windows 7 download. You acknowledge that you, not windows7download, are responsible for the contents of your submission. However, windows7download reserves the right to remove or refuse to post any submission for any reason. Windows 7 Download periodically updates pricing and software information of NOD32 Antivirus (32 bit) full version from the publisher, but some information may be out-of-date. You should confirm all information. Using warez version, crack, warez passwords, patches, serial numbers, registration codes, key generator, pirate key, keymaker or keygen for NOD32 Antivirus (32 bit) license key is illegal and prevent future development of NOD32 Antivirus (32 bit). Download links are directly from our mirrors or publisher's website, NOD32 Antivirus (32 bit) torrent or shared files from free file sharing and free upload services, including Rapidshare, MegaUpload, YouSendIt, SendSpace, DepositFiles, DivShare, HellShare, HotFile, FileServe or MediaFire, are not used.